The Winner for the title of Best Lye Soap For Sale was Grandma’s Lye Soap. Do You Want the WINNER of this Game? The winner of this contest is the best lye soap for sale. In this Squeaky Clean Bar Soap Division match-up, Grandma’s Pure Lye Soap kicks off the season versus Kirk’s Original Coco Castile Soap. Grandma brings experience and a basic offense to the table. This team isn’t loaded with talent. But, the talent they have has many gifts and is very strong. Kirks Castile brings natural, animal-friendly talents to the field. And, Kirks has a larger fan base. The Squeaky Clean Bar Soap Division of the Lotion Challenge League kicks off the season with this classic challenge. Will the age and experience of Grandma be able to stand up to the no fuss, no muss strength of Kirks? Here are the players (ingredients) for each team (product). That’s it! Grandma is not a deep team. But, she has deep talent in each of these players. And, it was enough to win the title of Best Lye Soap for Sale! Also, not a deep team. This makes this a great match up of teams that are both not deep in quantity, but deep in quality of talent. The coach for Kirk’s Original Coco Castile Soap opens the game with their strength. Coconut Soap comes out for the opening drive. Grandma isn’t really sure what Coconut Soap is and looks confused on defense. Coconut soap generates a strong surge using saponification. Using additional players like fat and lye, coconut soap builds and builds pushing Kirk’s down the field. Grandma doesn’t seem to have an answer for coconut soap as Kirk plunges into the end zone over an offensive line made up of fat and lye. After a long drive, a short plunge from 4 yards nets Kirk’s an early TOUCHDOWN! Extra point is GOOD! Grandma’s Pure Lye Soap might be short on quantity when it comes to players with talents. But, the players they have are dominant and multi-faceted. Lard is a major player on this team. And, the lard used by Grandma is “food grade”. Well it means that Grandma’s Lard is high in quality pig fat. And, this player plays well with others to provide the engine of a well oiled Grandma cleaning machine. Lard opens the drive for Grandma using the talent of washing off very well. So, on this opening drive, Lard sheds Kirk defender like they just aren’t there. Unable to hang on, Lard plows through the Kirk defense slipping through defender for 80 yards of solid clean offense. The drive ends on a 14 yard gallop where Lard uses his pig fat to drive the pigskin into the end zone for a TOUCHDOWN! The Lard extra point (being mild on skin) was GOOD. Seeing Grandma open their offense with a dominant drive has made the Kirk coach look a little worried. Kirk’s coach looks down his play card and make eye contact with Vegetable Glycerin. Or, Glycerol, which is what his teammates call him. Glycerol was popular during the free agent signing period with the other lotion teams. Sometimes Glycerol relies on animal fat. But, during the off season Glycerol developed a pureness based only on vegetable oil. This has made the vegetarian fans very happy with Kirk as a product. Glycerol is very durable. It can withstand very high or very low temperatures. This is especially important during playoff time when this type of talent is needed for cold outdoor venues. From a skin point of view, Glycerol beats any defense that tries to dry out the offense by bringing the heat. Glycerol is able to combat those skin damaging forces by drawing up water from the lower layers of the skin. Against the defense that Grandma responded with, Glycerol was a great response by Kirk’s. With big play (animal friendly) after big play (skin drying protection), Glycerol moved down the field with surprising elegance, and scored on an exciting 28 yard air strike for a TOUCHDOWN! The extra point (hygroscopic properties) was good. Grandma Lye’s number two player is Water. Lard and Water provide a strong one-two punch for this bar of soap. By including Water as a strong player on the Grandma team, Grandma’s Lye is able to keep skin soft and moisturized during game time. An important talent of Water is the ability to shed tacklers. Water rinses off easily in the shower and doesn’t leave any residue. Defenders just aren’t able to get a good grip. Grandma Lye Water shoots through the gap for a powerful 13 yard gallop up the middle. TOUCHDOWN! The extra point (moist skin) is GOOD! Kirk’s Original Coco Castile Soap responds with Coconut Oil. Coconut Oil has been a real up and comer on the lotion scene. This secret weapon has been making the rounds on many talk shows displaying various talents. In the Lotion Challenge league not all of these talents help Kirk. But, many of these talents directly translate into points for the Kirk coach. The best talents for Kirk’s Soap is Coconut Oil’s ability to moisturize skin. Coconut Oil turns in a run of soft skin for big plays moving the Kirk’s offense down the field. Kirk’s Coconut Oil blocks Grandma’s big Sun shining linebacker with a sun screen play. Coconut Oil blocks well on the play for a 24 yard gain. Kirk’s Coconut Oil is in excellent shape from it’s talent to lose weight. This lead to a nifty 17 yard scamper down the sidelines for another big Kirk’s gainer. Grandma just isn’t able to keep up with Kirk’s Coconut Oil’s talents and the talent of improved brain function give Kirk’s a big play on a trick play. Kirk’s Coconut Oil picks up the pigskin (moisturizes it just enough while keeping it from being slippery) on a fumble rouskie play. While Grandma is looking for her spectacles to try and find the ball, Kirk’s Coconut Oil slips outside for a 24 yard TOUCHDOWN run! The extra point (Coconut Oil fights Alzheimers) is GOOD! Grandma’s Pure and Natural felt the embarrassment of being scored on by Kirk’s trick play. But, Grandma is one tough old bird. Down on the end of her bench, Grandma’s coach has a strong player to respond with. And, that’s just what Grandma did. Sodium Hydroxide is sent into the game to clean things up. Sodium Hydroxide came to Grandma as Lye, also known as Caustic Soda (lye soap for sale). Lye has a lot of talent for this skin game. Lye can play in many forms. Being colorless and odorless and slippery to skin, makes Lye a difficult player to find, grab and tackle. Lye uses it’s slipperiness to slide down the sidelines for a 25 yard gain. Grandma’s Lye is also a very strong cleaner (the best lye soap for sale) that is great at removing impurities. Lye’s number is called on this quick drive and eats up Kirk’s dirty defense with ease. Lye runs around the left end destroying grease for a 14 yard gain getting out of bounds to stop the clock. Takes a screen pass on the right plowing through dirt for 21 yards. Grandma call timeout to stop the clock as time in the 1st half is waning. Lye squirts up the middle to finish the drive with a 3 yard plunge into the end zone for a TOUCHDOWN! The extra point (increasing alkalinity to neutralize acids) was GOOD! The Kirk Castile coach looks for their own flavor of Water to keep their offensive momentum flowing. Kirk’s own Water brings a lot of subtle talent to the game. One big talent is evaporation. So, when the defense is trying to damage your skin or hair, Kirk’s Water gets out of the way to let the other talents on this team shine. On the first play, Kirk’s Water takes a screen pass on the right side. Just as Grandma’s defense has Kirk’s Water surrounded, Water evaporates and the defense is left wondering what to tackle. By the time Grandma has figured out that Water has lateraled back across the field to give Coconut Soap the ball again, the field is wide open for Coconut Soap to slide down the sidelines for a glimmering 50 yard gain. Grandma recovered just in time to push Kirk’s Water out of bounds and into the Gatorade table. What a mess! After Kirk’s Water’s failed attempt to slip through the middle of the line for a big gainer, Water takes a reverse call on the next play and rubs the defense out with a 18 yard scamper into the end zone. TOUCHDOWN! The extra point (extreme moisture) was GOOD! This game began with huge expectations for the players that sport huge amounts of talents. Each team has rolled out almost all of it’s talents in the first half. And, the results have been devastating on each teams defenses. The question will be whether each team has the stamina to last the entire game. And, if each players talents are sophisticated enough to keep fooling the defense after the defense has had the halftime to make adjustments. Kirk’s does seem to have one additional player to rely on for spreading around the work load. But, Grandma’s talent is very strong and just may not be stoppable. We’ll have to see if which coach can dig deep into their defensive playbook and scrub out some defensive stops. The Grandma coach opened the game with Lard. And, comes back opening the second half using Lard. The bench is very short for this team, but the players on Grandma know what is expected of them, and they have worked hard in the off season and during the practice week to prepare for being used more than players on other teams. Lard started the game using it’s talent of easily washing off impurities to plow through the Kirk defense. In the second half, Lard knows it can’t rely on that same talent as the defense has likely made adjustments by bring in bigger more clingy defenders to pile up and stop Lard. Lard brings in it’s anti-foaming talents in the second half to confuse the defense. Keeping it’s edges in place bring cohesion to the offense and hinders defenders trying to bubble up into the backfield. Great blocking results in big plays of 21 and 13 yards. Lard suppresses foaming defenders to allow the Grandma liquid to firm up into a solid offensive wedge. Solid blocking of foam drives into the defense for additional runs of 7, 8 and 5 yards. Lard’s anti-foam talent allows Grandma to formulate solid soap bars on a consistent basis. Kirk is unable to penetrate the Lard anti-foam blocking as Grandma slides off tackle for a 6 yard dive into the end zone for a TOUCHDOWN! The extra point (helps fight acne) is GOOD! Grandma wasn’t ready for Coconut Soap on the first drive of the game. But, now they’ve had a first look, and a chance at halftime to make adjustments. Grandma starts out by trying to load up on the defensive line with anti-fat linemen. Kirk anticipates this move and call a misdirection play faking it’s patented saponification play to the right side, but then cutting back towards the left side. With Kirk’s fat any lye ready for the change in directions, Grandma’s fat falls all over itself going the wrong direction and can’t adjust quick enough to get back to Coconut Soap. The misdirection play nets saponification for 43 yards. Grandma then stays at home fighting saponification and limiting it to short gains of 3 and 2. On a big 3rd down play, Coconut Soap completely neutralizes defensive Lye and is able to break through for a first down. With a more Grandma dirty resistance on defense, Kirk struggles its way into the red zone. Grandma’s halftime adjustments seem to be making headway. But, in the end, Kirk’s saponification’s ability to completely neutralize Lye is the difference, and Kirk plunges over the end zone line for a 1 yard TOUCHDOWN by Coconut Soap! The extra point could not be found and Grandma blocks the attempt. NO GOOD! Grandma’s home grown Water explodes into the game with a big splash. Bringing talents like moistness and clean, clear pores, Grandma’s Water washes over the Kirk defense with a waterfall of power. Water first squirts up the middle for runs of 5, 8, and 13 yards. Grandma’s Water then runs a pass play to clear out the defensive pores in the Kirk secondary. Water is just standing there in the middle of the secondary for a 35 yard completion. Water then is absorbed within the skin on the next play, sticking close to Grandma’s lineman, Water trickles over the left side of the defense for another first down. Bring talents of light texture, Grandma’s Water sneaks downfield on an out route and causes the defense to slip in Water’s tracks. Water catches the out pass on the 5 yard line for a first and goal. On the next play Water burst up the middle for a TOUCHDOWN! The extra point (deep skin absorption) is GOOD! Kirk seeing Grandma’s Water make the Grandma offense flow, responds with Kirk’s own home brewed form of Water. Kirk’s Water has all of the same talents as Grandma’s Water and rides those talents down the river of success like the best of them. Kirk’s Water (KW) having had success in the first half against Grandma’s defense starts off this drive with the same play that garnered 50 yards. However, Grandma made the right adjustments and Water got backed up after receiving the screen pass and couldn’t make the lateral to Coconut Soap and the play loses 5 yards. KW calls a rush to the right side and the Kirk blockers open up a hole that Water flows through in a deluge of power. Grandma is almost unable push Water out of bounds as KW gushes down the sidelines for a huge 34 yard gain. KW calls two running plays that dribble for 2 and 2 yards bringing up a 3rd and 5. For 3rd down, Kirk lines up in a shotgun with 4 WRs, 2 on each side. KW lines up in the inside slot on the right side and the 2 WRs cross. Grandma’s DB get slowed down in the crossing current and KW is able to catch a pass 4 yards up field and Grandma isn’t able to clamp down enough to keep Kirk’s Water from seeping forward for the extra yard and the first down. Kirk’s calls Water’s number again with a moisturizer play. But, Grandma’s has inserted sponge like defensive lineman to soak up the run for no gain. KW sweeps left and spurts through a hole in the Grandma defense for a gain of 9 yards. On third and short, Kirk’s Water turns on the power sending all WRs to the sideline and bringing in a double TE formation. However, on the power run, Grandma is able to plug all the holes and keeps KW bottled up for no gain. Kirk is in FG range, and Kirk’s Water shoots a 54 yard FG up toward the uprights and through for a FG! Grandma’s Down, But Not Out! With plenty of time left in the game, Grandma feels the need to control the clock all the way to the end. Sodium hydroxide, or Lye (in this case, the best lye soap for sale), is chosen as the talent that Grandma will rely on. With just over four minutes left in the game, Grandma is in no hurry to score. But, being behind, Grandma is showing a little nervousness as a mistake at this point in the game could cost Grandma the game. To start the drive, Sodium Hydroxide leads Grandma’s offense with some running plays. Using Sodium Hydroxide’s colorless and odorless talents, the Kirk defense isn’t able to sniff out Sodium Hydroxide and the first three plays go for 4, 3 and 5 yards (and a first down). With time winding down to the two minute warning, Grandma still has a long way to go to get into field goal range. Still having three timeouts, Grandma drops back into a shot gun formation. But, late in the play clock motions for the RB Sodium Hydroxide to join the QB in the back field to block. Taking the snap, the QB takes a step back and looks to pass long enough to get the defense to take a step back. The QB then hands the ball off to Sodium Hydroxide on a draw play. Sodium Hydroxide slips past the defense that is in an all out rush to the QB, and breaks to the outside into the open field. As the Kirk linebackers see the draw and react, they are able to track down Sodium Hydroxide (Lye). But, not before Lye is able to slide down field for 16 yards. Sodium Hydroxide motions the Grandma offense to the line of scrimmage quickly and is able to get off a quick snap before the two minute warning for a sweep to the right side for another 7 yards as the two minute warning expires. After the two minute warning, the Grandma coach instructs the Grandma offense to keep eating up clock and making short gains. Sodium Hydroxide follows these instructions with a 4 yard gain and another first down. Grandma takes her time again getting to the line of scrimmage, and on the next play punches the defensive lineman P. Ivy, and E. Czema in the mouth for a strong push of 4 more yards to the 37 yard line. As the clock drops below one minute, the Kirk defense is feeling the game slip away, and they call a timeout. After the timeout, Grandma pitches the ball to Lye for another sweep (Grandma is hoping for a clean sweep as the best lye soap for sale), but Kirk sends the kitchen sink at Grandma with an all out blitz. Lye is tackled in the backfield for a 5 yard loss that force Grandma into calling a timeout for the big third down and 11. Grandma brings in alkaline as a third WR to work with Sodium Hydroxide. On the play, the Grandma QB drops back to pass, and the extra dose of alkaline does the trick to neutralize the Kirk Acidic DBs. With the extra alkaline, Sodium Hydroxide is able to sit down in a Kirk DB pocket and receive the Grandma pass for a 15 yard gainer and a first down on the 27 yard line with 35 seconds left. Kirk uses its seconds timeout. Grandma then runs up the middle and Kirk anticipating the play stuffs it for only 1 yard. Kirk uses its last timeout. On second down, Grandma runs again up the middle for another yard to the 25 yard line. As the clock gets to 3 seconds, Grandma uses its second timeout and brings out the FG unit. Sodium Hydroxide sets up on the 32 yard line for a 42 yard FG attempt to win the game. The snap is a little low, but the holder grabs it cleanly and holds the ball. The kick is up and sails towards the right upright. The ball just clears the right upright as the clock expires. The kick is GOOD! 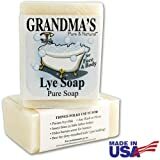 Grandma’s Pure Lye Soap retains the title of Best Lye Soap for Sale. Kirks Castile wins the coin toss and will receive. 0 - 7 7:23 Kirk's Coconut Soap plunges into the end zone from 4 yards. TOUCHDOWN! Extra point is GOOD. 7 - 14 9:23 Kirk's Glycerol catches a strike from 28 yards. TOUCHDOWN! Extra point is GOOD. 14 - 21 2:12 Kirk's Coconut Oil fumble rouskie run down the left sidelines for 24 yards. TOUCHDOWN! Extra point is GOOD. 21 - 28 0:24 Kirk's Water on a reverse for 18 yards. TOUCHDOWN! Extra point is GOOD. 28 - 34 2:10 Kirk's Coconut Soap plunges into the end zone from 1 yard. TOUCHDOWN! Extra point is NO GOOD. 35 - 37 4:12 Kirk's Water kicks a 54 yard FG.